I read an interesting article in the May/June 2013 Wireless Design & Development magazine. The article was about the Natalia Project, which is named after a human rights worker Natalia Estemirova who was assassinated in 2009 as she was investigating the alleged kidnappings, torture and extrajudicial killings by Russian government troops or paramilitaries in Chechnya. The Natalia Project is wireless alerting system (much like active RFID tags). The bracelets are able to send distress signals when activated by the wearer, or when the bracelet shows signs of tampering. The tampering sensor activates automatically if the bracelet is removed by force. If the wearer activates the alerting mechanism manually, the bracelet engages a patented locking mechanism to lock the bracelet onto the wearer's arm. The technology used is a combination of Global System for Communications (GSM) and a Global Positioning System (GPS) chip. The GSM chip is used for sending alarms and location coordinates while Short Message Service (SMS) and other data is sent via General Packet Radio Service (GPRS). If GPS location signals are not available, locations are derived by GSM triangulation. When a distress signal is triggered, a signal is sent via GPRS to the Civil Rights Defenders servers in Stockholm. There, the authenticity of the alarm is verified and decisions are made as to what information should be shared or posted on social media platforms. Notifying the local police is not a default action of the distress signal, since in many cases, the local police or government agencies could well be the source of the threat. Volunteers to the Natalia Project can get involved by signing up to receive notifications of distress signals sent from human rights defenders through several social media networks. The hope is that if the public has more visibility into the continual well being of human rights workers, that those that would attack human rights workers would be aware that their actions are being watched. Knowing the exact time and location of an attack can also help catch the attacker(s) quicker and possibly prevent more killings of human rights workers around the globe. The obvious caveat to the bracelet is that it must have cellular coverage in order to transmit an alert. I wonder if it's not possible to re-work the technology used in the bracelet to record periodic GPS coordinates. Then, if an alert had been triggered and the wearer was not in a cellular coverage area, the bracelet could send the last known GPS coordinates. That isn't a perfect solution, but it might be a helpful workaround. Recently I was asked about ways a customer could mount their access points lower than the 25 foot ceiling present in their building. The physical structure is occupied by AC ducts, electrical conduit and fluorescent lighting at the full height of the ceiling, making installation of access points at that height undesirable for many obvious reasons. One option is to mount the access points to columns by using an Oberon 90 degree wall mounting bracket. This bracket retails for $80, which can quickly add to the overall cost of your project depending on how many access points need this installation option. I asked the twitter-verse for input and received several good links to sites where DIY solutions are featured. One recommendation uses what appears to be a metal book stop repurposed as an angle bracket, another uses common parts found at a hardware store to create a quick, inexpensive mounting solution (by Timothy Dennehy). 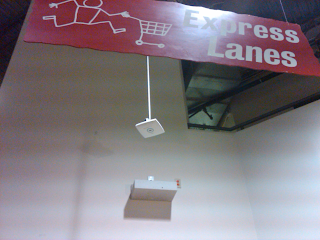 Other commercially available solutions involve suspension cables to literally hang the access point from the ceiling, or suspend it off of a threaded metal rod. 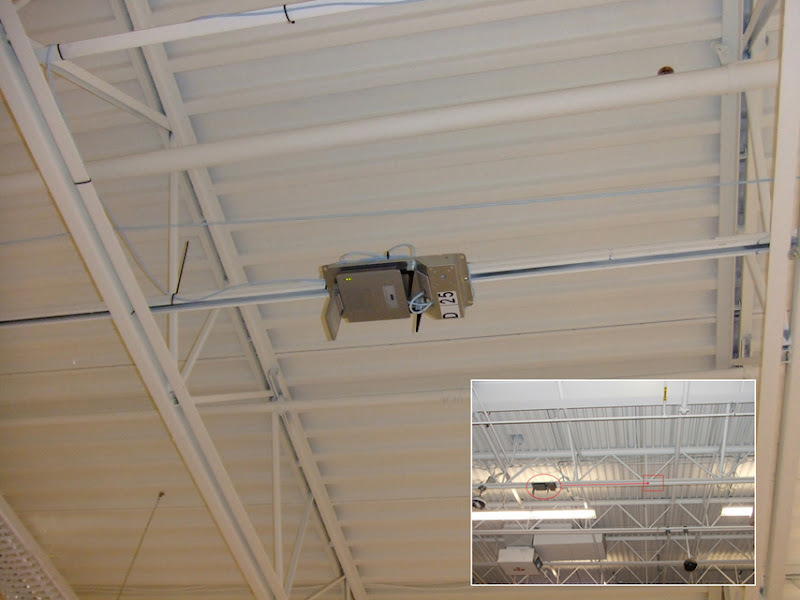 A similar mounting structure can also be created from off the shelf parts by using threaded metal rods and toggle bolts to tighten the access point to an overhead I-beam in a warehouse environment. For every commercially available solution, there is a way to do it cheaper if you've got the time brainstorm a solution from the parts and pieces available from your local home improvement center. Not all mounting solutions are equally aesthetically pleasing and ultimately the aesthetics of the final installation could be the deciding factor in the mounting solution chosen.